A north-east business centre faces being demolished after a deal to sell it reportedly fell through because of the cost of ridding the building of asbestos. Glenugie Business Centre and a neighbouring property on Windmill Street were listed for sale in 2016 for £450,000 but have lain empty since. Despite a mystery potential buyer showing interest in the granite building, Aberdeenshire Council has confirmed a sale will not be going ahead. At the last meeting of the Buchan Area Committee the issue was discussed in private. An anonymous source has revealed that, after discovering asbestos in the building, the potential buyer entered an offer of £120,000 which was rejected by the council. The source said: “Before the buyer purchased the building they received a report to show both buildings were contaminated with asbestos and were speaking about a six figure sum to get rid of it. “Obviously the buyer then went back to the council and asked to reduce the price by the cost of disposal or for the council to get rid and the buyer would purchase at the original price. The buyer’s plans for the building was to convert it into a full time nursery for young children with a hall that could be leased to groups for evenings and weekends. The source continued: “The buyer offered £120,000 after discovering that it would take over £100,000 to dispose of the asbestos but this was rejected. “Up to two weeks ago the buyer was still willing to negotiate but they have decided that it is a no. “Now one of the options is to flatten both of these beautiful buildings on the site and make way for another car park that no-one requires. “What does not make sense is that the council will still have to pay for the disposal before knocking it down. Minutes of the area committee meeting show members agreed to refuse the revised sale price, recommend the properties be demolished in part as soon as possible with traditional features being kept and the granite retained and resold. It also agreed careful consideration be given to use of the site once cleared for possible affordable housing. 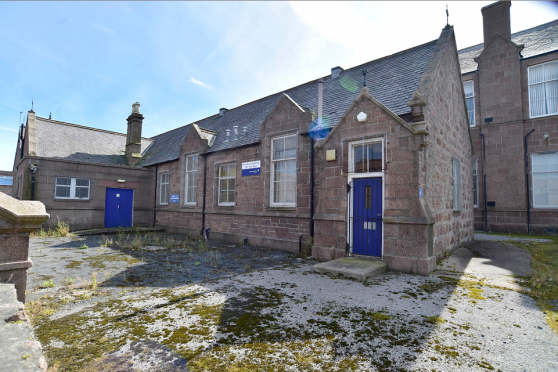 An Aberdeenshire Council spokesman said: “Following negotiations with an interested party, a possible sale of the building will not now go ahead. “The Buchan area committee has asked officers to consider possible options for the property and detailed investigations are ongoing. “Options include retention of all existing buildings, full or partial demolition of buildings and alternative uses including, but not limited to, affordable housing. The potential buyer could not be contacted.